Are you fascinated by amazing growth stories? Then the immense success of Arvixe web hosting provider for more than 11 years will impress you to no end. It has managed to carve its name among the top hosting service providers, because of its proven performance and track record. It also offers support for Windows hosting in addition to Linux hosting, which is a rare thing to find among web hosts these days. Apart from this, the reliability offered by Arvixe ensures that you do not have to look elsewhere for your hosting needs. However, you need to have a detailed look at all its features, along with its advantages and disadvantages, before you can decide whether Arvixe is the ideal hosting service provider for your website or blog. So, with this article, our aim is to provide an honest review of the Arvixe web host, especially since we have tried it out for a couple of our websites. It was founded in 2003 in San Luis Obispo, California by its CEO Arvand Sabetian and its staff works remotely, which has enabled it to save plenty of operational costs over the years and makes it stand out. This probably explains why Arvixe is able to offer a large variety of hosting plans for individual webmasters, small businesses as well as large enterprises at very affordable prices. The fascinating growth story of Arvixe is laden with several awards from different authorities, such as HostReview and the Inc. magazine. It has also won several editor’s choice awards, for example from the PCMag website. It has been a Better Business Bureau (BBB) accredited business since 2011 and has received an A+ rating from them, which is the best possible rating. EIG bought Arvixe from its joint owners Arvand Sabetian and Avanquest in October 2014 and it will be interesting to see the turn of events in Arvixe’s way of working during the upcoming years. What is the first thing you look out for in any web host? Your answer will, of course, be its performance and server availability. Isn’t it? Arvixe offers 99.9% uptime on an extremely consistent basis and we decided to go with Arvixe after reading about the uptime reviews from its existing customers which they proved to be true. In fact, at the website besthostratings, Arvixe is the top rated web host with the highest uptime rating among the more than 370 hosting providers listed. A major reason for the excellent uptime percentage offered by Arvixe is their well-managed data centres spread across various locations, such as the U.S. (Dallas, Chicago and New Jersey), Europe (Amsterdam) and Asia (Hong Kong). This enables you to select the data centre that is located closer to your targeted site visitors and thereby achieve great web page access speed for them. They deliver full redundancy in supplying data centre power (UPSs) to servers as well as heating, ventilation and air conditioning. In case of any power disruption, they are well prepared with backup generators to handle the situation efficiently. Arvixe makes use of multiple Tier 1 telecom providers accompanied with direct internet connections. This enables them to easily bypass transit networks as well as shorten the network path between your site visitors and your website. This leads to a powerful performance with lower latency and maximum speed. The speed of your website is given a further boost through the use of CloudFlare. Arvixe makes optimum use of state-of-the-art network monitoring software along with well-defined monitoring and escalation procedures in order to ensure the best possible measures for security and reliability. Using the right kind of segregation software helps to achieve appropriate separation of your site from others on a shared network. This kind of separation achieved for every user with its own rooted environment helps Arvixe to achieve optimum levels of security. Arvixe offers a host of other security features with all of its hosting plans in the form of brute force detection, nightly security updates, firewalls and anti-DDoS tools. It offers solid technical and sales support to you, depending on your hosting needs. For any issues faced, you can submit a ticket on their website, or use the Live Chat support. Alternatively, you can also contact the U.S. support staff via phone at 1-888-927-8493 at any time of the day. When we tried to test their Live Chat support and telephonic support, it was observed that the waiting time for an Arvixe representative over the telephone was considerably more than that for the Chat representative. Clearly, the waiting time over the phone needs to be reduced for timely support. Also, the official Arvixe site contains plenty of useful documentation (knowledge base) to help you with various hosting related queries. It offers the industry standard cPanel that is extremely user-friendly and helps you to carry out most of the tasks, like site management, domain management, email account maintenance and backups for offline storage. If you are an experienced webmaster, you could have encountered cPanel with one of the other web hosts before, so this makes it very easy for you to deal with your Arvixe hosting account as well. For Windows hosting, it offers the WebSitePanel, which is also pretty easy to use and manage. Arvixe is committed to providing you with the best services. It is confident about its offerings and thus provides you with a 60-days money back guarantee, which entitles you to try out Arvixe hosting without any risk. Arvixe has various plans on offer along with flexible time periods for subscription. Since Arvixe supports Linux hosting as well as Windows hosting (ASP.Net hosting), the plans are offered separately for each. PersonalClass ASP, PersonalClass ASP Pro, BusinessClass ASP and BusinessClass ASP Pro for Windows hosting. This starts at around $429 per month with nightly security updates, around the clock dedicated support, data centres with SAS 70 Type II Certification, cPanel for Linux, WebSitePanel for Windows, free domain registration for life, free SSL certificate for life and more. This starts at around $108 per month with 100% server management by Arvixe, around the clock dedicated support, data centres with SAS 70 Type II Certification, hypervisor-based technology, economical servers and more. Offers Windows-based hosting in addition to Linux hosting, which is pretty rare to find. Offers unlimited monthly data transfer along with a free domain name for life with most hosting plans. Flexibility to purchase the majority of Arvixe hosting plans on a monthly subscription basis in addition to half-year subscription and one-year subscription options. The money back guarantee period of 60 days is pretty long and allows you to know everything about the web host before taking the final decision of whether or not to continue with Arvixe. The Arvixe phone support waiting time needs some improvement. The dedicated server hosting plans are very pricey. 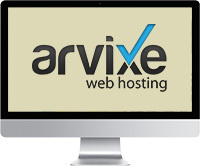 With the variety of hosting plans on offer by Arvixe, it is clear that you can use it (risk-free with the 60-days money back guarantee) for your simple website or blog, e-commerce site or enterprise site. There are plenty of customer reviews available on different websites about Arvixe that can help you decide on the hosting plan that suits your requirements the most. This review simply confirms Arvixe’s rank among the top web hosting service providers going around. Is it worth it to invest in Arvixe? We hope you got the answer after reading this detailed analysis of all its features.